This deed is described on the title page as an abstract of the Title of David John Davies (corrected by hand from Oxhey Builders Limited) to freehold land situate at Hillcroft Crescent, Oxhey, Watford in the County of Hertford. The document is dated 1932 (corrected by hand from 1934, although parts of the document relate to 1933). The main thrust of the document, however, seems to chronicle the land being developed in 1933 as Raglan Gardens from ownership by the Blackwell family, through ownership by Mr Davies to Oxhey Builders, up to their development plans. The document begins with a 6 inches to the mile map, headed “Plan on Mortgage: 1910 August 24th” (first imge). A mortgage was made on 24th August 1910 between 1) Samuel John Blackwell of Brookshill, Harrow Weald, Middlesex, Esquire J.P. and 2) Thomas John Pitfield of Petworth, Sussex and John Symonds Vidler of Rye, Sussex, “Reciting seisin of said S. J. Blackwell in fee simple and agreement for loan of £6,000. In layman’s terms, this simply means that Mr Blackwell took out a mortgage of £6,000 from Messrs Pitfield and Vidler for the named property. This had already been in his possession for over 30 years, so he may have needed to raise money. The property is described as Oxhey Lodge Farm, Oxhey Hall Farm, Broadfield and part of Oxhey Bridge Farm. 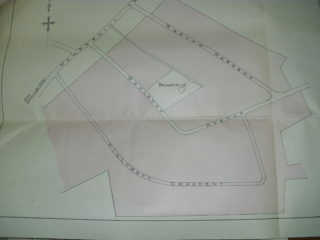 A schedule of plots with usage and acreage is included. Total acreage is given as 404 acres, 2 roods and 29 perches. On 23rd August 1910, John Weall of Watford, a land agent, confirmed that the property had originally been purchased in 1977 by Thomas Blackwell. On his death in 1879, it passed to his son, Samuel John Blackwood, who had been in possession since then. On 24th October 1911, Messrs Pitfield and Vidler confirmed that Mr Blackwell had previously repaid all the interest due, and that he had now repaid the principal sum of £6,000. The mortgage was now repaid. On 9th August 1913, Mr Blackwell (whose address is now given as The Manor House, Chipperfield, Herts) took out another mortgage on the same properies with John Whetham Boddam Whetham of Folkestone, Kent, Sir James Kenneth Douglas Mackenzie of Scatwell, Thomas John Pitfield of Bournemouth, and John Skelton Downes of London, for a sum of £5,000. On this occasion, the schedule specifies the tenants of the various properties, who are Reginald Dickins, Herts County Council, Mr H. E. Wiggs, The Oxhey Golf Club Ltd. And Colonel Button. On 31st December 1914, the mortgage was transferred from the group above to Mr Boddam-Whetham (here hyphenated, though it wasn’t before), Mr Downes, William Edwards of London, and Northwood Rawlins of London, with the note that the £5,000 plus interest now belonged jointly to the new group (the Transferees). On 18th March 1918, Mr Boddam-Whetham died, and was replace in the group of mortgagees on 26th November 1918 by Walter Hayes-Sadler of Thurnham, Kent. On 9th June 1920, it was recorded that all outstanding money owed on the mortage had been repaid, and the property reverted to Mr Blackwell. Another map follows, headed “Plan on Indenture: 1924 October 3rd”. This is much larger scale and only includes part of the land covered on the first map (second image). On 22nd December 1919, Mr Blackwell made a will appointing his sons, Richard Giraud Blackwell, Francis Samuel Blackwell, Thomas Charles Blackwell and Robert Arthur Blackwell, as executors and trustees. Codicils were made on 27th March 1920 and 28th September 1922, without affecting the disposal of this property. Mr Blackwell died on 26th January 1923, and the will was approved on 24th March 1923. On 3rd October 1924, the brothers sold part of the property to David John Davies of Wembley, Middlesex, for £12,500. This included Oxhey Lodge Farm and parts of Oxhey Bridge Farm and Oxhey Hall Farm, a total of 134.125 acres. This appears to be the area marked on the second map. It excludes Broadfield, whose owner is guaranteed right of way to Hampermill Lane, and a number of stipulations are made concerning use of the land, including types of building and other land-use permitted. A schedule of the lands included is given. A verification is given, dated 9th September 1924, of the payment of estate duty following Mr Blackwell’s death. On 30th July 1932, Mr Davies applied for the restrictions specified in the sale to be modified to the extent of allowing development of semi-detached houses to be built. This was allowed for part of the land involved, though not for all. 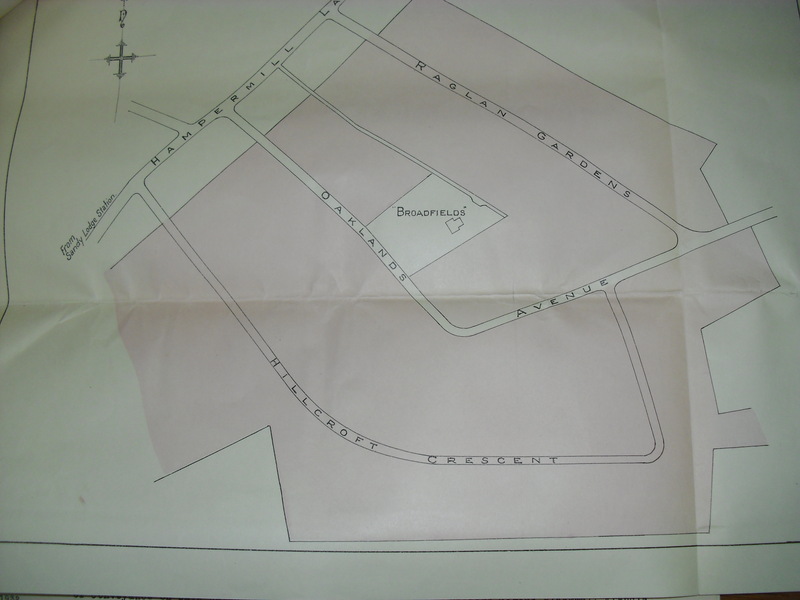 A map headed “Plan on Conveyance: 1933 October 5th” appears to be connected with this application, and refers to the development of Raglan Gardens (third image). 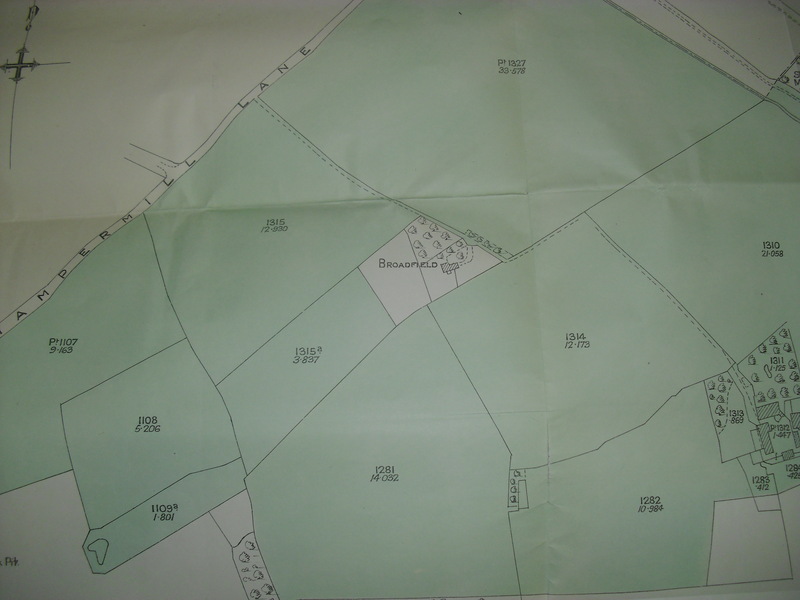 On the same date as the map, the land highlighted was sold by Mr Davies to Oxhey Builders Limited of Watford. Again, many restrictions are made on the land-use, including where and what kind of buildings are permitted (“semi-detached or detached dwelling houses and outbuildings connected therewith”) and rights of access for the owner of Broadfield. On the same date, Oxhey Builders took out a mortgage with the Norwich District Provident Permanent Benefit Building Society for £6,300 to develop the land into a “Building Estate”. The terms of the mortgage specify that, unless the mortgage is redeemed, the building society will be entitled to hold all the premises for the term of 3,000 years – in other words, they’d lose their rights to the land on 5th October 4933 AD. On an unspecified date (given merely as 193 .) it was recorded that Oxhey Builders had repaid the sum (also left blank) and all rights to the property had reverted to them. It’s specified that this relates to “a new road called or intended to be known as Raglan Gardens” and guarantees right of way on Raglan Gardens and the “private road” to the south-west. Finally, on another date given only as “193 .” another mortgage was taken out by Oxhey Builders with the same building society, this time with the company’s directors standing as Surety. The amount borrowed and due to be repaid was also left blank on the document. These are my findings as promised. There is a bit of overlap with the main entry above !! Who Owns Broadfields Lane ? – A summary of some research findings. Apart from general interest, the research detailed below was done in response to the discovery by HCC (Hertfordshire County Council) that when they planned to open a Sure Start centre in the community centre which is located near the bottom of the lane, they did not know who to approach to get permission to tarmac onto the lane. They had to avoid this boundary when they did the work. The findings below have been given to District and County councillors but there does not seem to be resources available to pick up the researches. In the section headings below HLS is Hertford Local Studies Archive. Ref. 1. 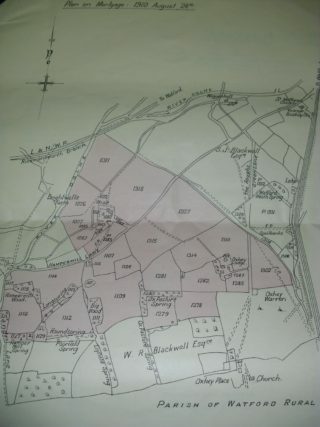 HLS file ‘Acc 4449’ From 1872 to 1924 various members of the Blackwell family own by purchase or inheritance a patch of land comprising Oxhey Hall farm, Oxhey Lodge farm, Oxhey Bridge farm and Broadfields House. Oxhey Lodge farm is located near Highlands where there are still a couple of houses which could have been farm cottages. It is the part of this farm land south of Hampermill lane which is to form the Oxhey Hall estate. The file gives no indication where Oxhey Bridge Farm is located. On 26 Jan 1923, S.J. Blackwell dies and on 3 Oct 1924 his 4 sons sell the land of Oxhey Lodge farm to a David John Davies of Wembley Hill Road, Wembley. At this point in the file is a detailed (but not accurately to scale) map of the area being sold. It clearly shows that the whole estate is sold EXCEPT for an isolated ‘island’ of land surrounding Broadfields House but the sale does include Broadfields Lane. The document specifies that there is a right of access to Broadfields House along Broadfields Lane. (As an interesting aside the document also says that there is similar right of access along Green Lane to the golf clubhouse and to Oxhey Warren). Therefore in 1924 it would appear that the house is still owned by the Blackwell family but the lane has been purchased by this Mr. Davies. Valuation List 1923 – 1934 : owned by Colne Valley Water Company and then by W. Berisford and Son. (Presumably the estate agent.) (The exact date within this range is not clear). Valuation List 1930 – 31 : rate payer is W. Berisford. This information relates to the house and not the lane so is just of general interest. Ref. 3. HLS file ‘Acc 1216’. This is a recently acquired file at Hertford consisting of documents relating to St. Matthews Church. It has not yet been catalogued (as of 2011) but contains an envelope with documents relating to the purchase of Broadfields for the building of St. Francis Church. On 27 July 1933 Broadfields House and land surrounding it is sold by William Berisford to the Church Authorities. This transaction is received by the Charity Commission on 23 Sept. 1933 with a reference number 879/33. The document refers to a conveyance of this land dated 15 Feb 1926 between a Margaret Helen Calthorp and a Charlotte Jane Addison. This does not fit with information in ref. 2. above unless these 2 ladies owned the house between the Blackwell family and Colne Valley Water Company which is not impossible but seems a bit strange. On 8 Nov 1933 there is a conveyance between David John Davies and the Church Authorities of a strip of land alongside what is now 39 Oaklands Avenue. This is received by the Charity Commission on 23 Jan 1934 with a reference number 74/34. It would appear that Mr. Davies had a plot of land (designated to be 41 Oaklands Avenue) which he agreed to sell to the church for easier access than along Broadfields Lane. 18 Nov 1932 – first meeting to discuss the building of the church held at St. Matthew’s church. Discusses the purchase of Broadfields House, plot 112 in Oaklands Avenue (already referred to above as adjacent to what is now 39 Oaklands Avenue) and a 5’ 0” strip of land between Broadfields House and the road. The estimated cost of this purchase is £3510 with Broadfields House valued at £2500 – £2750. Note : The minutes do not name this strip of land nor the road which it connects to nor the owner but if it is Broadfields lane then this conflicts with other information below. To add more uncertainty, 5 feet is not wide enough for Broadfields lane as it exists today. This may be a red herring since it looks from ** in ref. 5. Below that this did not happen. ** 27 July 1933 – sale of Broadfields House (2 acres 1 rood 4 perches) by William Beresford to St. Matthews church for £2750. Right of way over Broadfield Lane given. 8 Nov 1933 – David John Davies sells plot 112 in Oaklands Avenue. 18 Dec 1956 – land fronting Oaklands Avenue (labelled as allotments) sold to HCC as an addition to the school land. This corresponds to what is now the houses between the entrance to St. Frances Close and the old school building (now demolished). 22 Aug 1958 – Broadfields House sold to a Peter George Archer. Proceeds used to build a curate’s house between Broadfields House and the Church. 12 July 1971 – sale by PCC to HCC of site containing the church and the vicarage. 30 Nov 1976 – A Miss M. Sinclair of Broadfields House applies for restricted covenants to be lifted so that the house can be divided into 2 separate dwellings. Ref. 6. Deeds of 2 houses which back onto Broadfields Lane. Two sets of deeds seen but permission not sought to publicise which the two houses are. Both contain an agreement that, for a given sum, the grantor (owner of Broadfields Lane) gives the grantee (the then house owner) right of access to their property via Broadfields Lane on condition that the grantee pays a proportional part of the cost of maintaining, renewing or resurfacing the lane as and when deemed necessary by the grantor. In both cases no such cost has been incurred to their knowledge since no work has been done. The interesting point is that the grantor is different in the 2 deeds seen ! 5 Oct 1933. David John Davies sells a patch of land to Oxhey Builders Ltd. Of 58 High Street, Watford for £7000. An attached map shows the patch of land to be what will become Raglan Gardens and Broadfields Lane is definitely NOT included in the shaded area. 1 Oct 1934. George Dixon Fryer stated to be a director of Oxhey Builders. 1 June 1955. £10 is paid by the then Raglan Gardens house owner (grantee) to this George Dixon Fryer (grantor) of Carwood House, 147 Hampermill Lane. He is stated to be a retired builder. I have been told by a long standing resident that Mr. Fryer built Hillcroft Crescent, Raglan Gardens and part of Oaklands Avenue. So, did Mr. Fryer buy the lane from Mr. Davies – perhaps after he died – see ref 9. below ? 18 Dec 1973. The then owner pays £50 to Kenneth Ritchie Proctor of Broadfields, Broadfields Lane. So, did Mr. Proctor buy the lane from Mr. Fryer and if so why, since he had access to Broadfields House from Oaklands Avenue ? Further Information about David John Davies . Ref. 7. Brent Local History Library. A gazetteer dated 1937 records a David John Davies as a dairyman living at 31-33 Wembley Hill Road, Wembley. The Library have no further information on him. Ref. 8. London Metropolitan Archive – deeds register. The records show about 60 land sales and purchases by a David John Davies (some dairyman !). All these are within the old county of Middlesex. As far as I can tell no similar records have been preserved outside Middlesex i.e. within Hertfordshire. Ref. 9. The London Probate Office, archive of wills. David John Davies of 24 Crawford Avenue, Wembley died on 22 Feb 1945. His will is dated 3 Aug 1927 i.e. after he purchased the land for our estate. A solicitor may be needed to decipher and interpret some of the detail but he appears to leave : (i) various artifacts and £1000 to his wife and (ii) his ‘real and personal estate’ to his trustees to sell and put the money in trust for his son to inherit when he reaches the age of 21. The trustees are (a) his wife Jane Charlotte Davies and (b) his son Howell McIntyre Davies who is recorded as being a major in the army. Ref. 10. The Land Registry – some online searches. Since Broadfields House was split two more houses have been built in the grounds. One is remote from Broadfields Lane, the other is adjacent to the lane – in fact it is now the only property on this site which has land abutting the lane. For this house (no. 13 St. Frances Close) the map on the Land registry site shows a red line around this house with some land. Broadfields Lane is shaded in yellow but with no explanation of the significance of this. An interesting feature is that there is a ‘hammer head’ at the top of the lane. The Land Registry map shows the red line around this property as including half of this hammer head. So, presumably this was purchased from some-one !!! - WHO ?? The problem could be solved just by following up the last finding – the point in bold at the bottom of the previous page – but how do you do it ? 1. Is it possible to find out what the executors did with the real estate owned by Mr. Davies when they enacted the terms of his will. 2. If George Dixon Fryer was the owner of Broadfields Lane in 1955 (Ref. 6. House 1) then when did he buy it, from whom and when did he sell it and to whom ? Did he also own Broadfields House at some point. 3. If Kenneth Ritchie Proctor was the owner of Broadfields Lane (and Broadfields House) in 1973 (ref. 6. House 2) then did he buy it from Mr. Fryer and when. Also when did he sell it and to whom. Can anyone add some missing information and bring the puzzle more up to date ? These maps and other more detailed ones will be familiar to any resident of this area (now known as the Oxhey Hall Estate) who has paid off their mortgage and studied their deeds. My interest is in a small piece of land shown not shaded near the middle of the second and third maps. This is Broadfields House and it is linked to Hampermill Lane by Broadfields Lane. This is also visible in the maps. Broadfields Lane but not the house was part of what this Mr. Davies bought but no-one seems to know who owns the lane now. I propose to post my findings on this when I get them a bit better organised !! David Hall.